…so keep that in mind when you read the review scores, as I rate them in the category “pocket trumpets for beginners” and that means leaving out reviewing the more expensive horns. This is why a cheap pocket trumpet can get a score of 9/10 or even a 10/10, because they are rated in their own class. If I were to put them up against 1000 dollar horns the scores would of course look a lot different. …I’ll start with the brands that are just a bit more expensive and then, the further down you go, the cheaper the pocket trumpets get. …and that is because this horn is one or perhaps two steps above all the rest when it comes to build quality, ease of playing and sound. ESPECIALLY the sound. Ah the sound, this horn has such an amazing sound that is hard to match by any other brands. …just take a look at this video and listen to how the Allora MXPT pocket trumpet sounds. It’s a pretty big sound…check it out! If money is not an issue in your family then this is THE pocket trumpet for you. It’s just such a good pocket trumpet brand for a beginner student, and if choosing this one, the aspiring trumpeter will have a high quality horn that he or she won’t outgrow for many years to come. On the other hand, if money is tight then continue scrolling down as they get less expensive as we keep going but, again, if you can muster up the cash, then really consider ordering the Allora. You can click here to check current pricing on Amazon. To find other trumpet players opinions on these horns I use a combination of asking my own trumpet playing friends as well as doing some online research. Note that I am NOT copying Amazon reviews as that is against their policy. If you want to read those, just click on any of the trumpet images and it takes you there. I will give the Allora pocket trumpet a good 9.1. I highly, highly, HIGHLY recommend the Allora if you have the money for it. You simply can not go wrong with this horn. It is a beauty to both look at and play and the sound is just awesome. If your wallet agree with the price then go for this one. I’m confident you will get many wonderful music memories playing it. This is a very nice pocket trumpet well worth its price. At the time of writing this article the price tag was surprisingly low, you can click here to check current pricing on Amazon. …or they might even stop working altogether. The stainless steel piston valves will prevent that from happening though. The intonation is good on the Stagg. Better than I expected actually. I also like the big sound I can get out of this little horn. Yeah, I would recommend it if you are looking for a good pocket trumpet in the lower end of the price range. You really get more than what you pay for with this horn. At first I thought the valves were going to be a problem but it turned out to be a matter of a short break-in period of about two days. I like the sound on the Stagg very much and it’s also easy to play. I’m happy about the purchase. The stagg pocket trumpet is a very good choice for a beginner trumpeter. It will serve you well for years to come and even if you’re more advanced it can be a really nice backup horn. Based on its current pricing and the amount of trumpet you get for the money I will rate this pocket trumpet 8,5 out of 10. The Merano pocket trumpet is also a good choice for a beginner student as the trumpet is both affordable and easy to play. The quality is not really on the same level as the Stagg or the Allora, but we are now talking about a pocket trumpet that has a lower price tag than those two brands. This can be a good pocket trumpet for a beginner because even if the young trumpeter changes his or her mind and decides to quit, you are not left with an expensive trumpet that you store under your bed because no one is using it. I love the blue color. The trumpet looks cool and the sound it produces is also great. Sure, it’s not a professional trumpet but I’m happy with it and I can recommend this pocket trumpet for a beginner student. If you are a bit unsure about the seriousness of your sons or daughters trumpet playing path, and you don’t want to spend money on an expensive trumpet, should the change their minds and quit playing, then the Merano pocket trumpet could be a good trumpet to invest in. It is both affordable and easy to play. In other words, a good combination when looking for a horn to start with. …because with the Mendini you get pretty decent quality for a surprisingly low cost. Sure, it is not a professional trumpet and it is not as good as the Allora pocket trumpet but considering the price to quality ratio, I’m actually going to score the Mendini higher than the Allora. Every Mendini pocket trumpet is play tested at Cecilio’s factory and re-tested at their Los Angeles distribution center to ensure that their high quality standards are met. I must say I’m impressed with how low the pricing is. You can click here to check current pricing at Amazon. As you can see if you click here to check the pictures on Amazon there are options to choose between these colors when you order the trumpet. Here is a guy unboxing and talking about his experience with the Mendini pocket trumpet. Watch the video! When I ordered mine I was honestly expecting to get a pretty crappy horn, but all the positive feedback made me curious. Turns out I was wrong. This little beauty is incredibly fun to play and the sound is also good. Some people have said that they had to stretch the valve springs a bit to get the valves running better but I did not do that as I found the valves to work perfectly fine from the start. If you want a good beginner pocket trumpet then Mendini is a great choice and it won’t cost you any more than a nice meal for two at a restaurant. This is so cool. I pay just a little more than 100 bucks and I get a pretty darn good trumpet. Even though this is not a professional trumpet it has excellent compression and the valves work well. I also notice no air leaks anywhere when I pull the slides out one by one and testing to blow with a finger against the openings. I also like the sound on the Mendini. It is warm and you can even detect a slight “core” in it. Just like the professional trumpets have. If you are looking for a good beginner pocket trumpet then look no further because it does not get any better this if you have less than 200 bucks to spend. So should you choose a pocket trumpet or a “normal” trumpet for a beginner? The most obvious difference between a pocket trumpet and a normal trumpet is of course the shape and looks. The pocket trumpet has the exact same amount of tubing and the length of the tubing is also the same. It is just a more compact version of a normal trumpet. This is physics and it has to be like this in order for the pocket trumpet to be pitched in B-flat, like the normal, big trumpet. One would think that the small pocket trumpet would produce a much smaller sound but this isn’t the case. In fact, it can produce a big sound with a robust tone. That said the pocket trumpet does not project the sound as well as the normal trumpet. This means you won’t find trumpet players using pocket trumpets in big symphony orchestras where the trumpet sound needs to projected out into the big hall. More often than not the pocket trumpet also comes with a smaller bell than on regular trumpets, and even if the pocket trumpets are able to produce a big sound, it can not really match a big horn with a bigger bell when it comes to how big the sound can get. There are exceptions though as not all normal trumpets are able to produce a huge sound. Here there are almost no difference. If you can play high notes on a regular trumpet you will also be able to do so on a pocket trumpet. The same goes for playing fast passages, long notes, soft melodies and so on. The playing range is the same on a pocket trumpet, with the lowest note being the low f-sharp, and the highest note depending on the ability of the player. For the most part the pocket trumpets are cheaper than regular trumpets and this one factor that makes comparing a regular trumpet to a pocket trumpet a bit more tricky. Holding a normal trumpet can be heavy work for a beginner trumpet student. 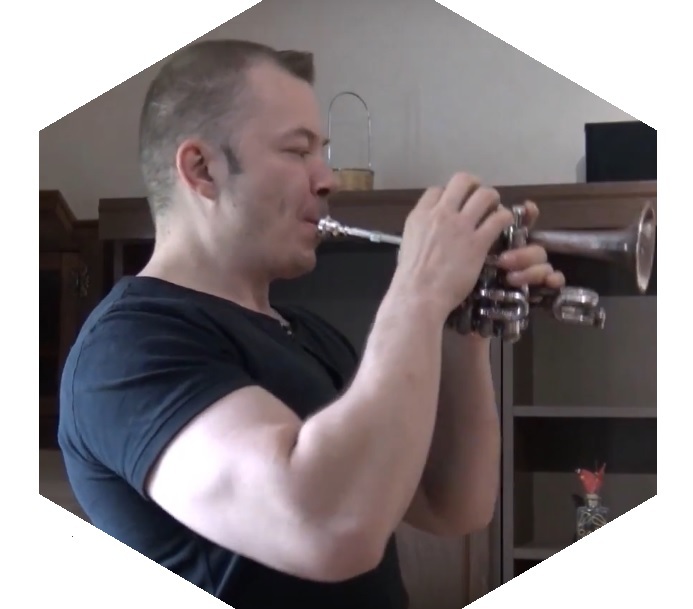 Here the pocket trumpet has a big advantage over the normal sized trumpet as we hold the pocket trumpet so much closer to the body, making it much easier to hold without getting tired arms. …anyway, considering this uncertainty it is wise not to invest too much money in a beginner trumpet and this is where the pocket trumpet enters the picture. Lastly, the pocket trumpet is easier to carry around because it takes up so little space. This is also one factor that makes many professional trumpeters want to own one since the pocket trumpets are so convenient to have in the car for extra practice time or for bringing it along when going on a trip, for example. If the student is already well on his way and shows no signs of fading interest and he really wants to start playing in many different bands and perhaps even pursue a professional trumpet career, then the student really needs to own a regular trumpet. …that said, it is of course possible to switch from a pocket trumpet to a normal trumpet later on if the student excels rapidly and the need for a normal trumpet grows. And since the pocket trumpets are so cheap there’s really not much “harm” done. Besides, the pocket trumpet can come in handy for practicing in the car or when traveling later in life. Q: What about the mouthpiece. Do I need a special kind of mouthpiece for the pocket trumpet? Q: Can I use the pocket trumpet for playing solo pieces and hymns in my church? A: Oh yes. The pocket trumpet will be perfect for that. Many people mistakenly think that the pocket trumpet is more of a toy than a real musical instrument but that is wrong. The pocket trumpet can produce an incredible gorgeous trumpet sound, so by all means, go ahead and use it for playing in church as well as in all kinds of other situations. Q: I’m going to play the lead trumpet part in a big band next year. Can I use a pocket trumpet for that? A: You can, but if the big band is playing on a pretty high level, musically, then I would recommend you using a normal sized trumpet for that. This is because higher level big bands are pretty loud and the lead trumpet part needs to be able to cut like a knife through the band. It is a bit easier to produce that cutting sound on a normal sized trumpet. Q: Should I buy a used pocket trumpet? A: That is certainly an option, but just make sure you get to try the horn before buying it in that case. Pocket trumpets are already pretty cheap, so I would recommend buying a new one as you might want to take advantage of the guarantee, should there be any problems with valves or other stuff. The Amazon shop has a 30 day 100% free return policy, for example. Unfortunately it happens more often that the less expensive pocket trumpet have some problems with sticky valves, than the more expensive normal sized trumpets do. So this is one more reason I would advise against buying a used pocket trumpet. Q: I can’t even spend 200 bucks on a trumpet. If you could recommend only one brand for me, what would be the best pocket trumpet brand for a beginner with this little money? A: In that case I would highly recommend the Mendini pocket trumpet. It has got a lot of positive testimonials and I honestly don’t think you can find a better pocket trumpet when considering the price tag. You can click the link above to check the pricing and read the testimonials on Amazon. Q: Are there any pocket trumpets in the key of C? A: Yes, but they are very rare and I would not recommend buying one. At least not at this point in time. Maybe when they become more common, and we start seeing more of them on the market but until then, I’d stay away from them as they are not yet well developed. C trumpets are commonly used in symphony orchestras anyway and you can’t use a pocket trumpet in the symphony orchestra, as I already mentioned earlier in the article. Q: Will I be able to play higher notes on a pocket trumpet? best trumpet mouthpieces for high notes as that might potentially help you with that. But remember, you have to practice and “earn” the high register. Q: I have always had problems with endurance. Would a good pocket trumpet help me with that? A: The only way I could see it helping is if you would be able to be more relaxed when playing the pocket trumpet. They are easier to hold so it could be possible, but other than that there really is no difference. Q: Pocket trumpets often come in cool colors. Will this affect the sound in some way? A: Well to a very small degree maybe. For example, silver plating do not dampen the sound as much as lacquer, but the differences are still very small and really nothing to be concerned about. If you think a green pocket trumpet would be cool to own then go ahead and buy one. Chances are almost no one can tell the difference in sound between the colors. Choose the one you like the most. Q: Is a pocket trumpet the same as piccolo trumpets? A: No. A piccolo trumpet is tuned an octave above the normal trumpet. Thus, the piccolo trumpet has shorter tubing than the pocket trumpet and the normal sized trumpet. Also, the piccolo trumpet is not something a beginner trumpeter should start with, as the piccolo trumpet is much more difficult to master than a regular or a pocket trumpet. Q: Are the Carol Brass pocket trumpets any good? A: Yes, they are. But they are also much more expensive that the ones I list in this article. They are phenomenal though and if money is not an option then, by all means, go for it! You’ll get a killer horn. If interested to find out you can click here to check the pricing on Carol Brass pocket trumpets on Amazon. In quality they are a few levels above the other ones on this page but, as I said, the pricing is also much higher. I hope you found this article helpful and make sure to think about how much money you are willing to spend. The trumpets in this article range from about 120-390 dollars and it is in that price range I would start looking when buying a suitable pocket trumpet for a beginner. That said, we are all different and some have more money to spend than others, so at the end of the day, we all have to find our own way.